Art & Eyes is New Orleans’ premier provider of eyewear and fashion accessories for people who want to wear stylish frames, handmade clothing, artful jewelry and truly unique accessories. We’re a high-end, art-to-wear boutique, as well as a resource for the person who wants excellent vision and visionary design from their glasses. Glasses are about more than just correcting your vision—they’re also a fashion statement for your face! The right eyewear in New Orleans, LA can accentuate your features, complement for style and give you a whole new outlook on your personal appearance. Art & Eyes is here to make sure you’re not stuck wearing another generic, unimaginative pair of glasses. We work to bring our customers truly unique frames and designer eyeglasses in New Orleans, LA, from brands that are hard to come by and beautifully bold. We’ve got more than over 1600 new styles at any given time! Whether you prefer classic and understated or thrive on intrepid, eccentric designs, we’ve got a pair of frames for you. Bold shapes, bright acetates and elegant angles characterize the frames at Art & Eyes, each one specifically chosen from the collections of the finest designers, classic brands and hot new upstarts alike. 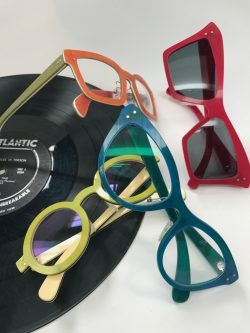 In addition to being a boutique for custom glasses in New Orleans, LA, Art & Eyes also maintains a huge selection of accessories, apparel and more. Owner Starr Hagenbring has a vast line of handmade jackets and apparel on display at all times, with even more art-to-wear items from guest designers each month. Come and visit us today to see how we marry style and design to practicality, for eyewear that’s beautiful and truly one-of-a-kind. We take pride in customizing everything we sell, so you never see the same style walking towards you on the street. We’ll make sure you’re one-of-a-kind! We offer designer eyeglass frames for all styles and budgets, from $64 to $880! We also accept Flex Spending Cards. Our shop frequently welcomes styles and products from guest designers. Check back monthly to see who we’re hosting or get in touch with us about hosting your fashions. Our products are curated from around the world, including countries like France, Belgium, England and Japan, to name a few. Our shop has been open since 2011, but we’ve been in the fashion and design industry since 2001! For everything from chic eyeglass frames to custom, handmade, artful jackets and beyond, visit Art & Eyes. We’ll help you find your style and customize it so you’re one-of-a-kind!